Ballet West kicks off 2019 with what might just be the most world-renowned classical ballet: “Swan Lake.” Artistic Director Adam Sklute’s rendition, which he originally set in 2010, features four separate casts to perform on various dates throughout this month. Between the spectacular theatrical elements and the astounding artistry typical of Ballet West dancers, this production is one you won’t want to miss. “Swan Lake” tells the tale of a princess named Odette (Beckanne Sisk) who falls under the spell of an evil sorcerer and spends her days as a swan along with other abducted women-turned-to-swans. Prince Siegfried (Chase O’Connell) falls in love with her, then falls again — this time into the sorcerer’s trap. The sorcerer’s daughter Odile (also Sisk), identical to Odette, seduces the prince. The romantic fairy tale inevitably ends with a reunion between the original lovers and a broken spell. The plot may ruffle some feathers as it highlights the prince’s leading-man warriorism and Odette’s female submission, and the dance plays up the representation of white and black as good and evil. The female principle artists and soloists, however, dance with impeccable strength, endurance, and precision, surpassing the roles of their delicate characters. The infamous cynettes’ quartet and Sisk’s 32 fouettés left audience members hollering on opening night. The cast certainly deviates from the whitewashed storyline with a relatively diverse cast for a classical company, which may come as a surprise for new audience members. Storyline aside, the performance is a well-rounded spectacle. The Ballet West Orchestra plays Tchaikovsky’s familiar tunes with every ounce of respect they deserve. The ornate sets and costumes help create both the suspenseful and festive environments of all four acts. The colorful attire in the castle scenes places audience members directly in the royal world (Taylor Swift actually rented the costumes the swans use for her 2014 music video, “Shake it Off”). Sklute tops it all off with appropriate special effects, including eerie mist and flashing lights. Beckanne Sisk in “Swan Lake.” Courtesy Ballet West. In the end, the dancers are the ones who leave the longest lasting impressions. Sisk’s striking contrast between the elegant Odette and coquettish Odile may fool audiences into thinking there are indeed two different dancers, which speaks to the impressive theatricality required of her performance. Jenna Rae Herrera performs the Neapolitan Variation pas de deux with the comedic abilities of a slapstick actor. Herrera transforms the minor role into a memorable one, not unlike Emily Neale and Gabrielle Salvatto in their Ladies in Waiting variations. Another artist to watch for is Christopher Ruud, who plays Prince Siegfried in the last two performances. This principal dancer will be making his final laps on the Capitol Theater stage before closing off this run of “Swan Lake,” in addition to concluding his career as a Ballet West dancer. He’ll then take flight and migrate from West to, well, only time will tell. 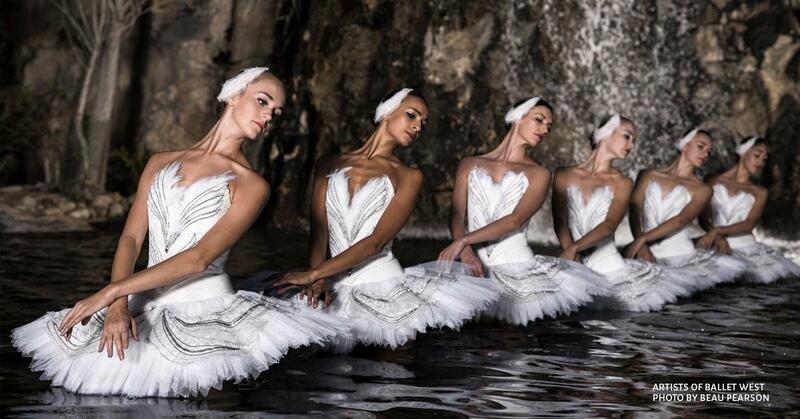 You can watch a matinee or evening performance of “Swan Lake” on selected dates all the way up until Feb. 23 at the Capitol Theater in Salt Lake City. Full-time college students can purchase up to two discounted tickets per show with a student ID (depending on availability). Tickets are $15 in advance and $20 on the day of the performance. You may purchase tickets over the phone at 801-869-6900 or online at boxoffice.balletwest.org. A ticket to “Swan Lake” would make the perfect Valentine’s Day gift for a loved one — whether it be for your significant other, a friend, family member or yourself. This performance will surely make hearts soar.